Vegetable Oil is much thicker than mineral diesel at typical ambient temperatures. Therefore, if a vehicle is to be powered by vegetable oil, the oil must be heated in some way before it reaches the fuel filter and the engine’s injectors, or a two tank vegetable oil conversion needs to be carried out on the vehicle so you can switch between vegetable oil and standard diesel/biodiesel fuel when starting (and turning off) the engine. 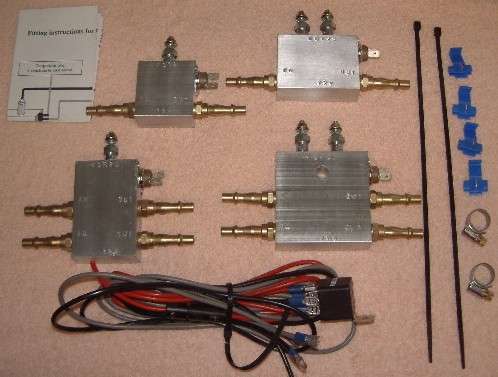 Pictured above is a range of fuel heaters from Vow2 suitable for biofuel conversions. They are inline glow plug 12V heaters which are very easy to fit requiring only a screwdriver and a pair of pliers. It will raise the temperature of vegetable oil fuel to 90 degrees celcius (thermostatically controlled). As soon as the oil is hot, you can start the car like normal. The disadvantage of this method is that only 70-90% oil can be used (10-30% diesel/biodiesel required) and the fuel pump is stressed by the thick cold oil at start up. Adding a water heater as well increases the percentage of oil that can be used in the fuel and the fuel pump will not be so stressed. During cold weather you would have to use straight biodiesel/diesel or fit a fuel tank heater. These heaters are available from around £30 – £100, with new glow plugs costing under £10. Replacing glow plugs is very easy requiring just a 12mm spanner. Find out more about processing Waste Vegetable Oil (WVO) into a car friendly fuel here.